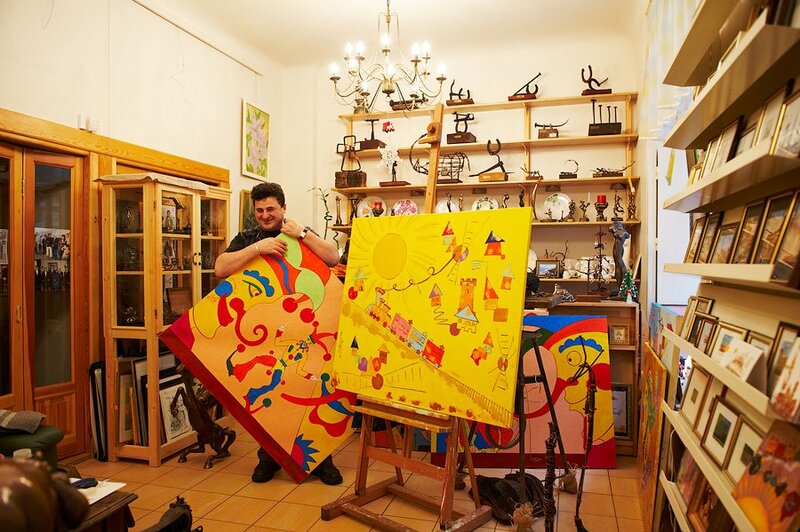 While art galleries abound in Old Town, at the moment there is only one on Laipu iela. Art Gocha is a one-man gallery, featuring paintings and sculptures by Gocha himself. Originally from Georgia, the artist moved to Latvia in the 1980s with one dream: to enter the Latvian Academy of Art. That dream came true in 1989, and in 1995 he graduated with a BA in sculpture. A few years ago he realised yet another dream – to open his own gallery – and he has been located here at 2/4 Laipu iela ever since. As a painter, Gocha works mainly in abstraction, yet his sculptures are highly realistic animal and human forms. He also does painting on porcelain. Stop on in and have a chat with the artist, explore his art work up-close, and you’ll soon develop an appreciation for Gocha’s fine art. different kinds of finishes too a nice, rich wood lovely. that a pole could've been handy in that situation.